Taking a bath is a special, relaxing moment for most people — the elusive Javan rhino seems to agree. 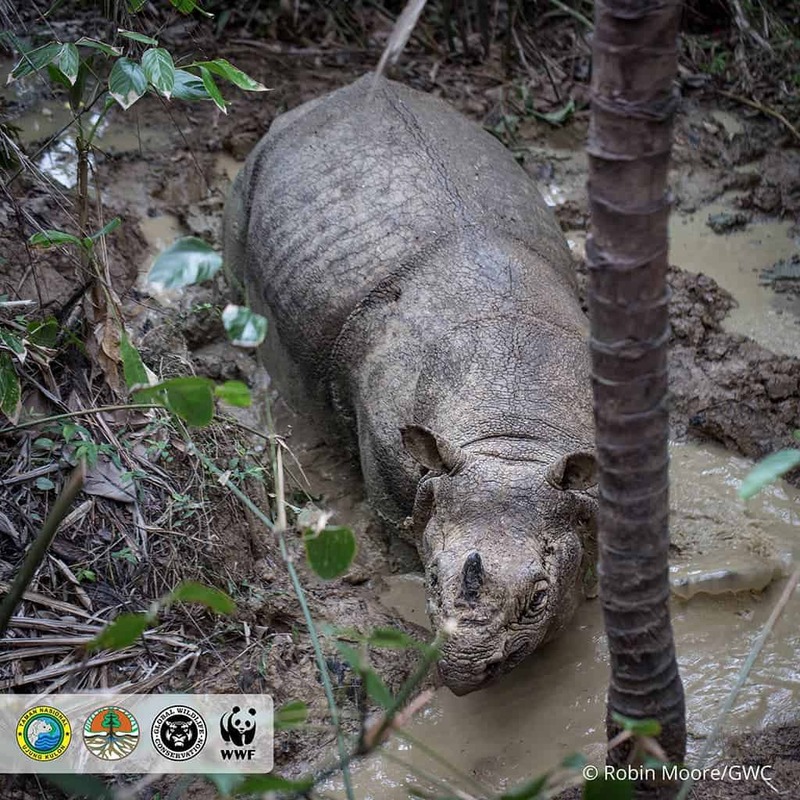 Conservationists working in Indonesia’s Ujung Kulon National Park have caught rare footage of a wild Javan rhino wallowing in the mud. This animal is the most threatened of the five rhino species, with only a couple dozen individuals remaining in the wild. When people think about rhinos, they tend to think about African rhinos. But Sumatran and Javan rhinos are just as iconic and, unfortunately, even more threatened than their African counterparts. Conservationists estimate that only 68 Javan rhinos remain alive today, all confined to Ujung Kulon National Park in West Java, Indonesia. The park lies in the shadow of Krakatoa, which means that a natural disaster in the area could wipe all of them out with one blow. However, the species has far more immediate threats to worry about: poaching, disease, and habitat loss. Javan rhinos were once common in parts of India, Bhutan, Bangladesh, Myanmar, Thailand, Laos, Cambodia, Vietnam, Indonesia, and Southern China. Across the centuries, however, humans have reduced the Javan rhino to a tiny enclave. Local communities had relied on the sub-species for food, but its demise was brought on by demand for its horn, which is prized in traditional medicine, and habitat destruction. The last Vietnamese Javan rhino was found poached in 2010 during a joint WWF and national park study. 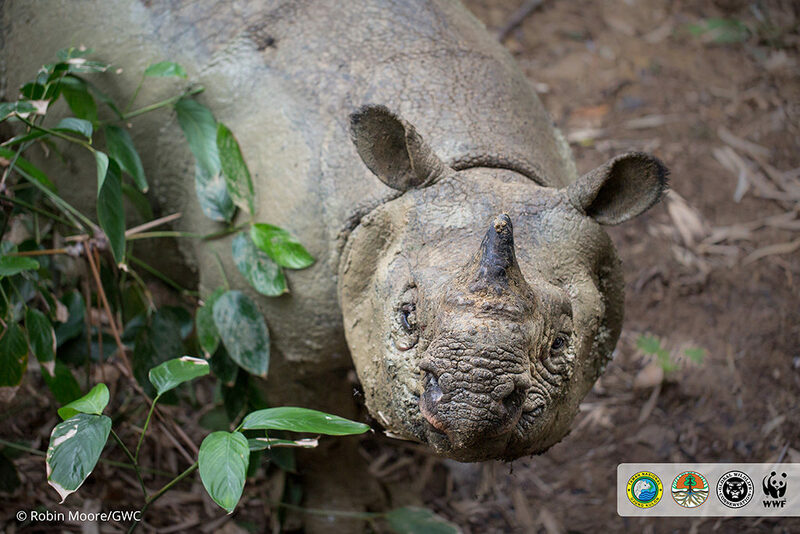 Since then, the Javan rhino can only be found in a single spot in the wild. The Javan rhino looks very similar to its closely-related one-horned rhinoceros relatives but has a much smaller head and less apparent skin folds. The animal’s skin is dusky grey in color and has numerous loose folds, which resemble armor plating. Not only are Javan rhinos few and far between, but they’re also very solitary creatures, which makes them much harder to find than their African counterparts. Researchers at Global Wildlife Conservation and WWF-Indonesia were able to film in near-dusk light, which offered the perfect lighting for the mud show. For Dr. Robin Moore, one of the team members from Global Wildlife Conservation who recorded the footage, meeting a Javan rhino for the first time was like a surreal experience. “The rhino is so rare and so elusive that it has a kind of mythical quality. The first days spent looking for it were unsuccessful, and you start to prepare yourself for the bitter disappointment of going home without a glimpse. Nothing happens, until it all of a sudden does. For me it was sitting on the platform that our team had built near a mud wallow, late in the afternoon of our fourth day of the trip. We were preparing to settle in for the night when a crashing sound to our right froze us to the spot. It could only be a rhino. We waited, holding our breath, willing it to appear. And when it did, emerging from the forest and into the wallow, it took the brain a moment to catch up and realize that this was really happening,” Moore told ZME Science. “It felt surreal – and such a privilege to be in the presence of this rare and majestic animal. The rhino stayed in the wallow long enough for us to relax into its presence and really soak in the moment. And then it surprised us by clambering out of the wallow and walking in our direction, before stopping and angling its head towards us. Seeing the glint in its eye was a really magical moment. And then it disappeared into the forest as quickly as it had appeared, and that was the last I saw of the Javan Rhino,” he added. 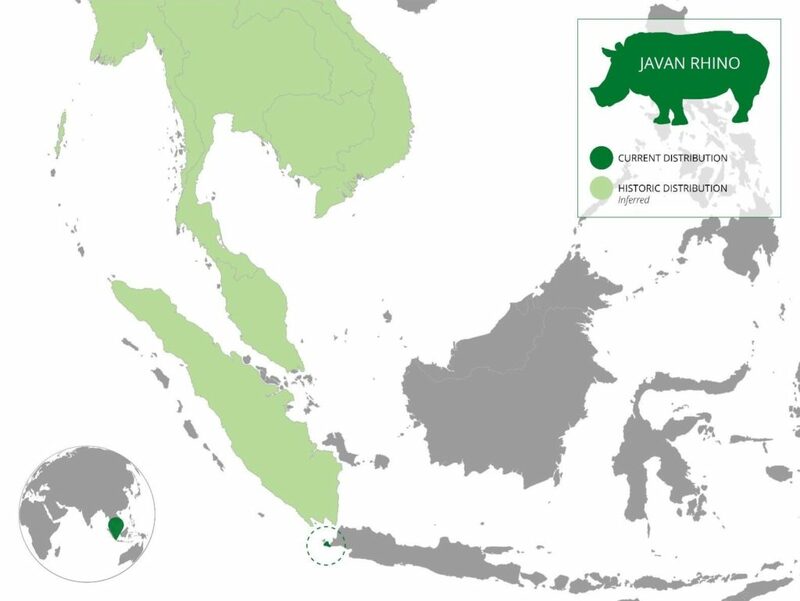 Population distribution of the Javan Rhino. Credit: WWF. The touching footage serves as a reminder that this rare and beautiful animal is in grave peril and that we must work hard to reverse its decline. There is some good news in this sense. In 1962, there were only 20 individuals left in the wild, but thanks to conservation efforts the population has climbed to 68 individuals in 2018. Conservationists at WWF are now working hard to breed more Javan rhinos, hoping to facilitate the birth of at least 13 calves by 2025. They would also like to establish a second population to shield the species from the risk of a major catastrophic event or disease outbreak. “We have successfully recovered the White rhino, Black rhino, and Indian rhino from close to extinction, the time now is to focus on the less well known, and highly threatened rhino species which are both restricted to Indonesia – the Javan and the Sumatran rhino,” Dr. Barney Long, Senior Director of Species Conservation at the Global Wildlife Conservation.